MANILA, Philippines - Can Psy produce another global hit like "Gangnam Style?" The Korean rapper will release his follow-up song to "Gangnam Style" on April 12, a day before he holds a concert in Seoul, South Korea. YG Entertainment announced that Korean fans will be the first to listen to the new song. On April 13, Psy will hold a concert called "Happening" at the Seoul World Cup Stadium where he will perform the new song, which will also be released worldwide on the same day. Tickets to the concert, priced ranging from 55,000 won (P2,044) to 110,000 won (P4,088), are selling fast as fans in Korea are looking forward to hear the new song. On the Korean shopping site Interpark, where the tickets are being sold, Psy's event is No. 1 on the real-time daily and weekly rankings among concerts. About 50,000 people are expected to see Psy's concert, which will also be streamed live on YouTube. 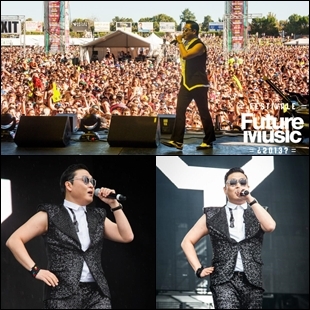 Psy performed at the Future Music Festival in Australia over the weekend. He sang "Gangnam Style" in the festival held in Brisbane, Perth, Sydney, Melbourne and Adelaide. Other artists in the event included Azealia Banks, Fun., Rita Ora, Ellie Goulding and Avicii. Since it was released in July last year, "Gangnam Style" has racked up 1.4 billion views on YouTube, the most watched video on the site. "Gangnam Style" sold 9.7 million copies in 2012 to become the third bestselling single worldwide. The song peaked at No. 2 on Billboard's Hot 100 chart and brought Psy international fame. The International Federation of the Phonographic Industry (IFPI) described the rapper as "the most successful of a recent wave of K-pop hits that have broken internationally." Recently, Psy revamped "Gangnam Style" by releasing a remix EP. The EP features remixes by Afrojack and Diplo, featuring 2 Chainz and Tyga. Psy is nominated in the 2013 Kids' Choice Awards, which will held on March 23 in the US. He is vying for the Favorite Asian Act against former Super Junior member Hangeng, Filipina singer Sarah Geronimo and Malaysia's Shila Amzah. "Gangnam Style" is also competing in the Favorite Song category along with Carly Rae Jepsen's "Call Me Maybe," Taylor Swift's "We Are Never Ever Getting Back Together" and One Direction's "What Makes You Beautiful." Psy visited the Philippines last month and held a show.